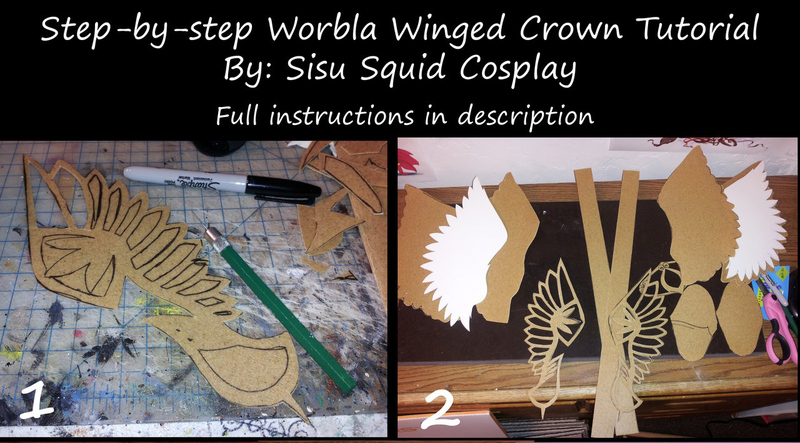 This is a tutorial on how to make a winged crown out of Worbla. The design itself is my unique creation, inspired by Valkyries. 1) Cut out the detail designs for the wing with an exacto blade. This was the most time consuming part of the whole process and my hand was very mad at me after. The details are a single piece of Worbla. 2) All the individual pieces cut out. I went with the “sandwich” method where there’s two layers of Worbla and a piece of 2mm craft foam in between the wings. This gives the Worbla some extra dimension. I also ended up making the band around the head 3 layers, not two as seen here. 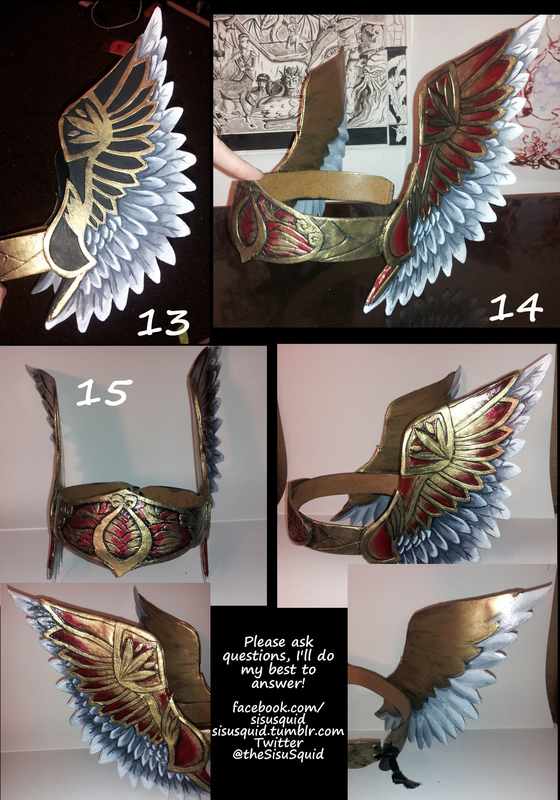 3) Using a heat gun, I heated up the Worbla and put a piece of craft foam in between the layers, then with the edge of a pair of scissors, flattened down all the edges so the feathers would be well defined. 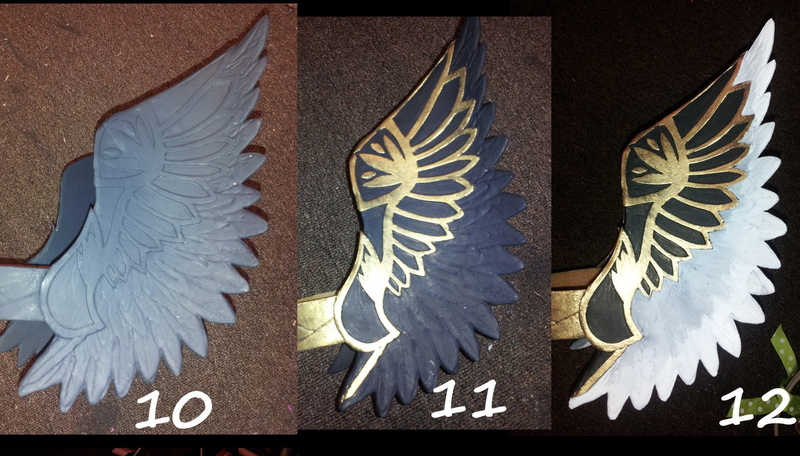 I had to reheat the Worbla several times through this process to make sure it would stick together properly. 4) Cut off the excess Worbla, and reheat/reseal any seams that the craft foam was showing through. Be very careful not to get Worbla bubbles during this process, and keep flattening it out! If you do get Worbla bubbles, you can carefully pop them with a push pin and squish the air out. Note: there is no such thing as waste when it comes to Worbla. Every single piece of scrap you cut off can be reheated and reformed. You can make whole new sheets of Worbla if you’re patient enough! 5) Heated and added the top detail piece. Worbla sticks to itself beautifully, so detail work like this is no problem! I recommend heating the piece up while on the desired location, because Worbla warps and bends once it’s heated, so it will be hard to transfer correctly once warm. 6) Detail work on the centerpiece. For more detail, I used a pen in the slightly warm Worbla to carve grooves. 7) All the individual pieces ready to be put together. I also added detail work on the band and wings with a pen. 8) Warm up the band and firmly attach the centerpiece. Then re-heat the whole piece and fit it to what you want it’s shape to be. Here, it’s my head so it was really easy to form. Be careful not to burn yourself! Wait till the crown is cool before you take it off, otherwise it might warp. 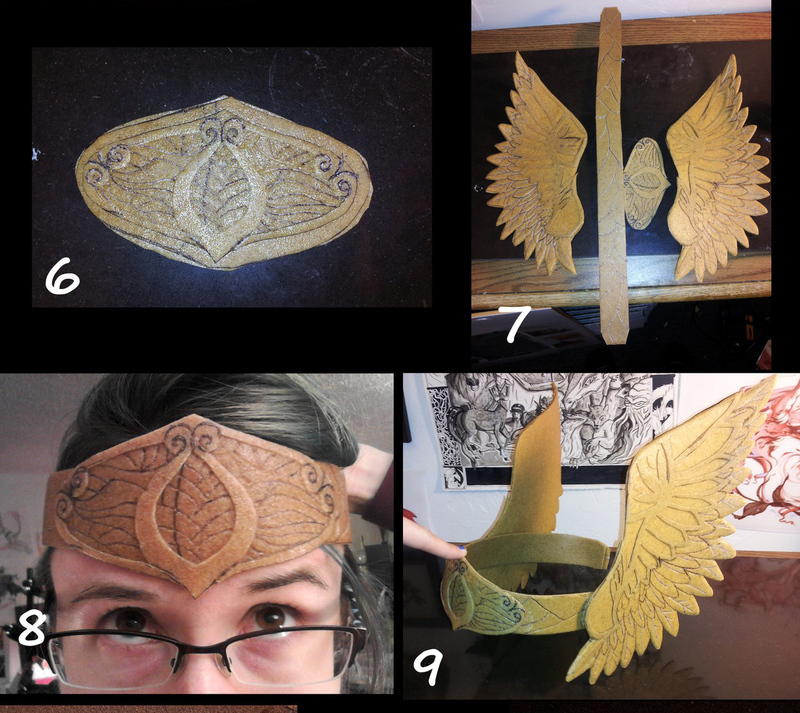 9) Heat the wings and the crown band where you want to attach them, and stick the whole piece together. I also bent out the wings a little at this time. Once it’s cool, it’s time for a primer! I use wood glue, and put on 2 layers. This helps make the Worbla nice and smooth. If you want the rough texture a base coat isn’t necessary. 10) After the glue is 100% dry, it’s time to base coat! I use acrylics for all my painting needs, and almost always start with a black base coat. One to two layers should do the trick. 11) Painted the gold by rubbing it on with a paper towel. This helped give it a more worn and metallic look. I then re painted the black around the wings so the detail was nice and sharp. 12) Paint the feathers the base colors. Here, I wanted a soft gradient from gray to white. Several layers and lots of patience was used here. 13) Added details with black paint, and many more layers of acrylics. 14) Added the red/gold detailing inside the decorations. Wood glue isn’t that easy to paint on, so more layers than normal was required to get the red a true red here. And that’s all there is to it! Please post any questions you have below, and I’ll do my best to answer them! Thermoplastics can be very intimidating, but I know you can do it!